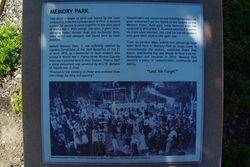 Memory Park was officially opened in 1919 as a memorial to those from the distict who served in World War One. Bhutan Cypress trees were planted in their honour. The park was redesigned and restored in 2014 and 18 trees were planted as a symbolic remnder of the trees planted in 1919. The war memorial which was originally in the park was relocated to Gloria Park in 1994. 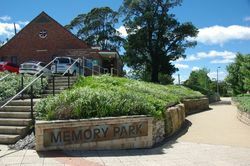 On Easter Monday there was a large gathering of residents and visitors at the thriving and picturesque little town of Hazelbrook on the Blue Mountains, on the occasion of the formal opening of Memory Park. This is a beautifully situated spot adjacent to the railway station, and was acquired through the activities of the local Progress Association in order to provide a charming resort for the people and to mark the patriotism of the young men of the locality, 71 of whom enlisted for active service and 12 of whom were killed. The organiser of the movement was Mr. E. Shelton. Mr. C. H. Morrow was president, Mr. H. A. Bourne vice-president, and Mr. A. C. Robbins secretary and treasurer. The opening ceremony was performed by Mrs. Campbell Carmichael, who clipped the ribbon (representing her husband's battalion, the 36th) which had been stretched across the entrance. The public then streamed into the park. A tree was planted in memory of each of the 71 soldiers who enlisted for active service. In connection with the opening ceremony Captain Carmichael, M.C., addressed the gathering. In the course of his speech he said: — "In a few months the remnant of the men will have returned. A few months more and the withered bay leaves will begin to fall and be blown here and there by the occasional gusts of rhetoric at an annual dinner. It is the way of the world, and we know it well, yet we cling to the hope that the inspiration of the deeds of those who fell in far-off France or in the Egyptian desert will not altogether die, because they loved Australia. We strive to believe that the same love of country which brightened the dark days of danger and defeat in France will inspire the actions of Australians in the troublous times ahead. And so we face the future in some hope that it may be purified by the inspiration from the past; for what hope have we if the traditions of the dead die with them." Sydney Mail (NSW), 30 April 1919. 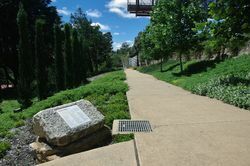 Note: The plaque states that 83 trees were planted in 1919, according to the Trove article 71 trees were planted including 12 to those who lost their lives in the war. This small triangle of land was leased by the local community from the railways back in 1916. It became a place for people to come together in the dark years of World War 1. With swings, see-saw, a giant slide, swinging boats, Roman rings and horizontal bars, some relief and pleasure was found here by local families. 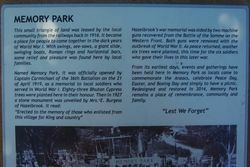 Named Memory Park, it was officially opened by Captain Carmichael of the 36th Battalion on the 21 April 1919, as a memorial to local soldiers who served in World War 1. Eighty-three (sic) Bhutan Cypress trees were planted here in their honour. Then in 1927 a stone monument was unveiled by Mrs E. Burgess of Hazelbrook. It read: "Erected to the memory of those who enlisted from the village for King and country"
Hazelbrook`s war memorial was sided by two machine guns recovered from the Battle of Somme on the Western Front. Both guns were removed with the outbreak of World War II. As peace returned another six trees were planted, this time for the six soldiers who gave their lives in the later war. From its earliest days, events and gatherings have been held here in Memory Park as locals came to commemorate the Anzacs, celebrate Peace Day, Easter and Boxing Day and simply to have a picnic. Redesigned and restored in 2014, Memory Park remains a place of remembrance, community and family. 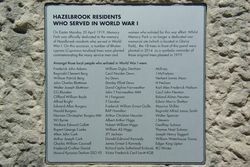 On Easter Monday 20 (sic) April 1919, Memory Park was officially dedicated to the memory of hazelbrook residents who served in World War 1. On this occasion a number of Bhutan cypress (Cupressus torolosa) trees were planted commemorating the many service men and women who enlisted for this war effort. 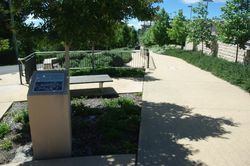 Whilst Memory Park is no longer a dedicated war memorial site (which is located in Gloria Park), the trees in front of this panel were planted in 2014 as a symbolic reminder of those original trees planted in 1919.